This is the first book I've read by Ware despite having had my eye on her previous books. I now regret not having picked them up sooner. I was immediately drawn into the story of four tight knit teenagers who met at a coastal boarding school called Salten. They developed the lying game where they would concoct elaborate lies to tell people who were not part of their small circle and award each other points. 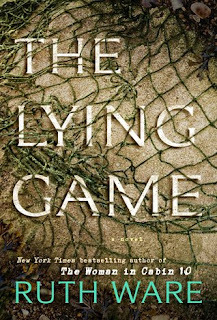 The game had rules, one of which was, never lie to each other. The girls are eventually kicked out of their boarding school and all go their separate ways until years down the road when their shared secret comes back to haunt them. A single text reunites them. The book jumps back and forth between Isa's perspective and their past. The story slowly unravels to reveal how they met, their shared secrets, and what became of each of them. I didn't give this book a full five stars only because the final reveal didn't blow me away as much as I had anticipated. I enjoyed the ride and discovering the mystery, I just wanted a bit more thrill and suspense. I am looking forward to reading more from Ware.